After over a decade of teaching in a classroom, Maurissa finally took her students outside. After leading GOALS expeditions through Cataract Canyon of the Colorado River and on Oregon's Wild and Scenic Rogue River, she now knows that’s where she and they are meant to be, and she’s looking forward to her third season as a GOALS teacher leader - guiding her group down the Main Salmon as it flows through Idaho's Frank Church Wilderness Area. Her absolute favorite part of any GOALS trip is watching students tackle new challenges on the river and then celebrating with them in the camp-chair circle, under the stars. Her second favorite part of a river trip is setting up and enjoying an anticipated annual tradition: River Spa Day. Who knew a river could be so glamorous? Maurissa did; that’s who. 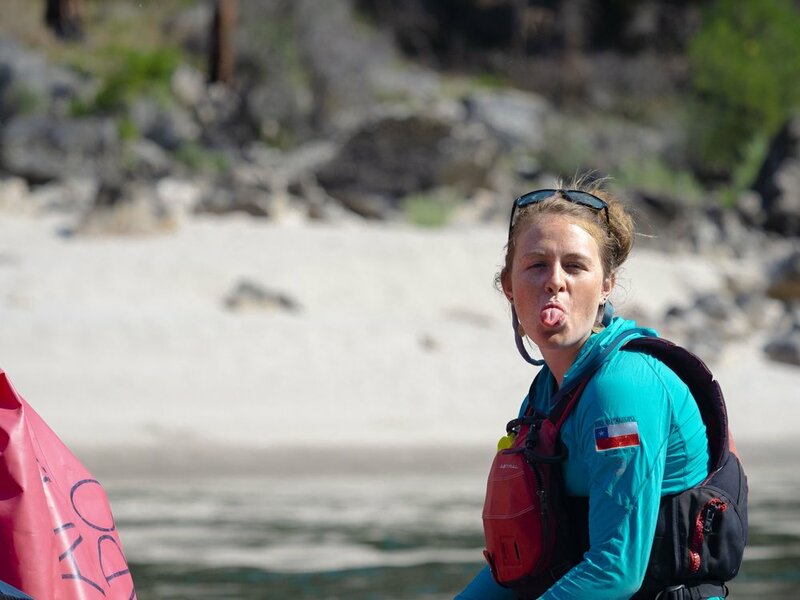 Tessa went on her first GOALS trip in 8th grade through Desolation Canyon on the Green River and immediately fell in love with life on the river. Since then, she has been on the Rogue River in Oregon, the Main Salmon in Idaho, and the Futaleufu in Patagonian Chile as a participant with GOALS, and has lead youth programs on Ruby Canyon of the Colorado River as it flows from Colorado into Utah . Now that Tessa has graduated the University of Montana with a degree in Community Health and a minor in Wilderness Studies, she is using all that education to train to be a commercial whitewater rafting guide in Missoula, Montana. Tessa’s favorite part of a river trip is making connections with the river and the people she experiences it with. In her spare time, Tessa loves baking treats for her friends and family and beating them at a game of Scrabble after she’s sugared them up. Aside from being on the river rafting and kayaking, Tessa enjoys backpacking and skiing in the winter. Genevieve Randa has been a classroom teacher for 11 years. She loves the joyful energy of students in classrooms, but knows how much that joy is amplified when kids are outside. Last year, she asked GOALS if she could help lead a trip, and her super strong muscles and goofy giggle won her a spot on a Desolation Canyon expedition. Her love of the river, sleeping under the stars, and helping kids play and explore outside got her hooked, and she's back for more in 2018! While leading an expedition, Genevieve particularly loves watching kids let their guard down from the beginning of the trip to the end, seeing them succeed in challenges they didn’t know they could take on, listening to the gurgling sound of the river eddies, looking up at the canyons that make her feel so small, and replacing the numbers on her watch with signals from the sun for an entire week. At home, she hikes, camps, skis, sings in the shower, reads a ton, cooks, and watches superhero/rock-star/princess performances put on by her 2- and 4-year-old daughters. She can’t wait for the Rogue River this summer, and for more adventures with incredible GOALS kids! 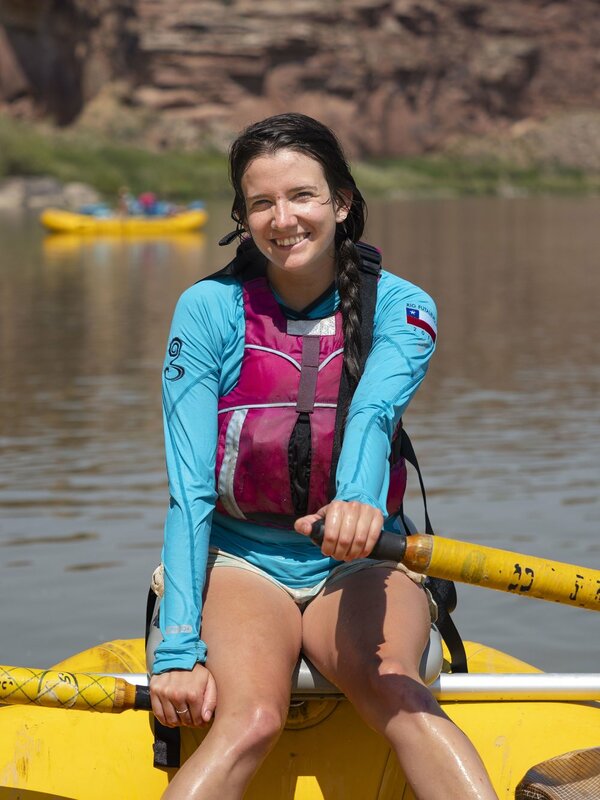 Camille's journey toward becoming a GOALS leader began as a student, experiencing her first 2 GOALS trips in Cataract Canyon during high school. The connections she created on those expeditions kept her close to the GOALS family - and she would return to the Main Salmon during college, then would ultimately be honored as one of the first ever GOALS oARLOck award winners - traveling to the Rio Futaleufu in Patagonia and leading GOALS expeditions for younger students with her hands on the oars. Camille is a caring and nurturing soul, whose mantra is centered around "wings" - and the idea that while we don't always know where the wind is taking us, we should spread those wings and be confident in our ability to land on solid ground in whichever direction we're headed. In the canyon, you'll often find Camille leading games or sketching with kids. She's an old soul with loads of wisdom to share, and brings a great deal of insight and mentoring to every child lucky enough to be one of her trips. This summer will be Scott’s third expedition with GOALS in Desolation Canyon - but it feels like he's been at it for much longer than that. 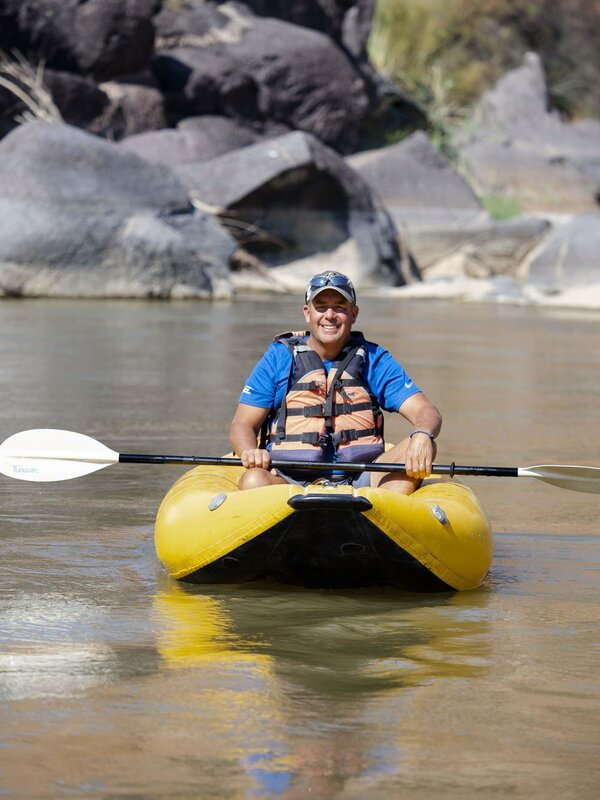 Besides the Green River, Scott has also been rafting through Brown’s Canyon on the Arkansas River numerous times, Clear Creek through Idaho Springs, the Potomac & Shenandoah rivers in Virginia, and most recently the Sarapiqui River in Costa Rica. Scott is a school counselor at Evergreen Middle School and he just finished a Master’s degree in teaching with a focus on biology, conservation, and outdoor experiences. Scott is passionate about providing opportunities for students to explore nature and experience outdoor adventure. These experiences, while beneficial for their physical and mental health, also develop a sense of curiosity in students and a passion for making positive changes in our world. GOALS provides the perfect opportunity for students to have these experiences, which is why Scott continues to lead GOALS programs for the kids at his school. Some of his favorite parts about being on the river are the thrill of going through a rapid, taking in the beauty of the canyon, bonding with others, and being disconnected from the demands of everyday life. He is excited for another trip this summer with a new group of students! As her picture suggests, Katie is just a big kid stuck in a teacher's body. Katie's involvement with GOALS began while she was working at an REI and heard of our programs. She reached out, and began leading outstanding elementary school programs for the students she was then teaching through Ruby and Horsetheif Canyons of the Colorado River. Then, we let her behind the curtain of the great and powerful middle school GOALS expedition. Katie was amazed by how much deeper the connections being made between participants seemed - and fell so in love with middle school GOALS expeditions that she not only began leading those, she even began teaching at the middle school level! 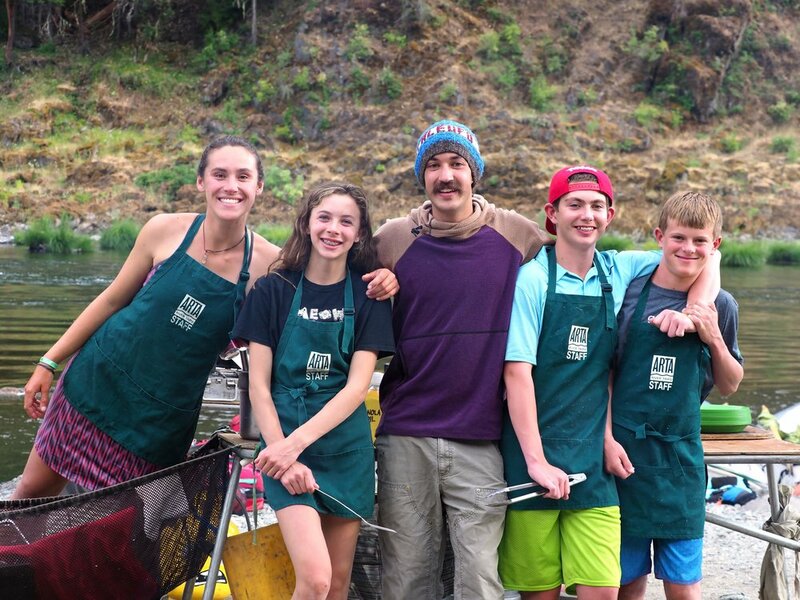 Through GOALS, Katie has lead programs on the Colorado, Green, Rogue, and Salmon Rivers. She is introspective and playful - she can lead group discussions about the meaning of life one moment and lead raft-bottom-slip-and-slide the next. She challenges kids while making them feel cared for and respected. She's an asset to any team, and we're proud that she's on ours. Some people are born to be teachers. Shonya Petrelli is one of them. Spend any time with Shonya, and you'll quickly come to realize how deeply she cares about making a positive, long-term impact on the kids lucky enough to find themselves in her class. Follow her social media posts, and you'll see a revolving door at Newton Middle School of young adults who were last taught by Shonya decades prior, but who find themselves returning for a visit to her classroom in the hopes one more more hug and the potential for a bit more of that special "Mrs. Petrelli" wisdom that makes us all feel like better people when we're around her. Shonya has lead her students through Desolation Canyon of the Green River in Utah, the Wild and Scenic Rogue River in Oregon, and the Main Salmon in Idaho. She looks forward to exploring Yampa Canyon in Dinosaur National Monument this summer. Johnnie has been an early childhood educator for the last 30 years. Over this time, she spent 30 years at the Fraser Creative Learning Center then 7 years at Graland Country Day School (GCDS). She will start the new school year at St Mary’s Academy. Outside of education, Johnnie has been an avid white water rafter for 37 years! She recently became involved with the GOALS program as a chaperone for the 2018 GCDS trip. Her favorite thing about a river trip is the relationships you develop through the road trip, the river trip and camp time. You get to know one another better in this short amount of time than some people know each other over a lifetime! Her unique skills include letting people discover the river through their own lens and guiding them as the opportunities for lessons unfold. Aimee has the heart to help empower children and help them feel good about who they are. She loves great opportunities for people who want to see children grow and become strong and confident. Aimee has volunteered as a Girls on the Run Coach for 3 seasons and loves being a mentor to students on the Graland Campus. She currently works as a Lead Teacher in the Graland Country Day School Early Childhood Learning Center. 2018 will be Aimee's introduction to GOALS, and she is excited to see where this adventure leads her! Ben's GOALS journey began in 2009, as an 8th grade student at Clear Creek Middle School exploring Desolation Canyon of the Green River. In the 9 years that followed, Ben has become a licensed professional river guide, and the captain of the United States mens' under-23 raft racing team. Ben has explored rivers throughout the western United States, and has even paddled in Costa Rica, Chile, Japan, and Dubai. He was chosen as one of the first ever GOALS oARLOck award winners - earning a spot on an expedition paddling the mighty Rio Futaleufu in Patagonia and the opportunity to mentor younger GOALS participants by leading their expeditions. Aside from being a great river guide, Ben is an also an outstanding role model. Kids who return from his trips often express that they can't wait to go on another GOALS expedition..."as long as Ben will be on it." Ben's favorite part of a river trip is "waking up every morning to the spectacular scenery that rivers offer… well, that or a properly cooked dutch oven cobbler. It’s really a toss up between the two." When he isn't on the river, you can try to track him down hiking to the best stash of backcountry snow or chasing great light with his camera. Brett began working for GOALS in May of 2009, while teaching middle and high school science and math. His motivation then was no different than it is today - the depth of lessons learned and strength of connections made are more profound on wilderness river expeditions than they could ever possibly be in the classroom. With this as his "north star", Brett has lead over 40 GOALS expeditions in Colorado, Utah, Oregon, Idaho, Chile, and Nepal. His time navigating rapids and sharing campfire stories have made him a better teacher and a more attentive student - both of which he's very thankful for. - gaining speed on a glassy tongue of moving water that leads right into the big splashy wave downstream. - turning nervous energy into a confident plan for teens as they scout a significant rapid and determine the proper line to get through it. - listening to the proud cheering that erupts from duckies and paddle rafts after successfully navigating that same rapid. - studying a wall of ancient rock art that puts time into perspective. - hanging out at camp as the late afternoon light turns the walls across the river colors that are difficult to describe or capture through the lens, but easy to appreciate. - laying in a sleeping bag on his boat, reflecting on the best parts of the day and anticipating what lies downstream while feeling the river gently rock him to sleep. When he's not on rivers with GOALS, Brett lives in Evergreen with his wife Kristin, their daughters Molly and Maya, and several dogs, cats, and chickens that round out the family. It is safe to say that Kristin has been more closely tied to the creation and evolution of GOALS than just about anyone else - save perhaps for the founder - to whom she is married. Kristin brings a passion for sharing the lessons she has learned through river travel to the kids she serves on GOALS expeditions - bravely stretching your comfort zone, curiously exploring the unique plants, animals, and landscapes that are found in river canyons that aren't found at home, and cherishing the gift of "river time" that allows life to slow down and offers ample opportunities throughout the day for journaling, reading, and even river-side yoga. Perhaps Kristin's greatest attribute is her versatility. She has lead GOALS expeditions for elementary school kids in Ruby Canyon, for middle school kids in Desolation Canyon, and for high school kids on the Rogue River in Oregon and the Rio Futaleufu in Patagonian Chile. When she's not amping up the energy level on the beach of a GOALS trip with her infectious giggle and fun personality, Kristin can be found in Evergreen, Colorado teaching Spanish, tending chickens, and exploring the great outdoors with Brett, their daughters (Molly and Maya), and their dogs (appropriately named Rio and Eddy). 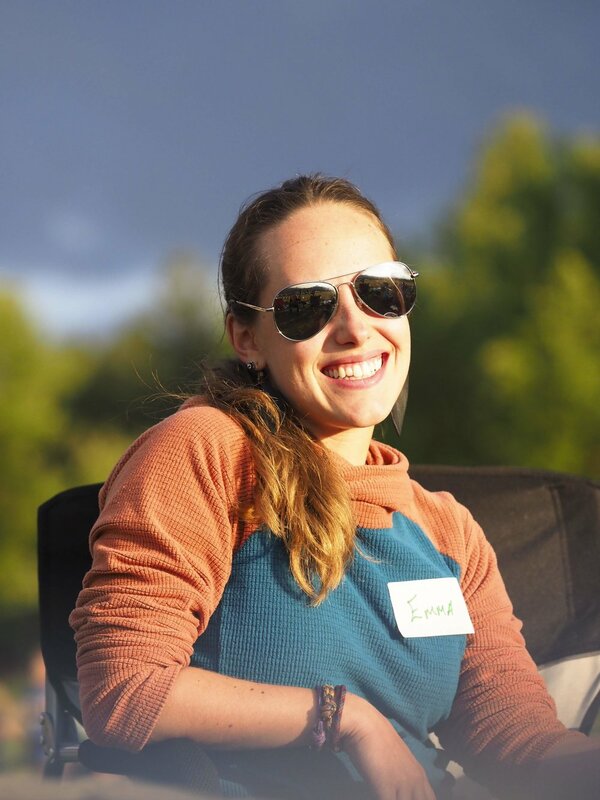 Originally from Evergreen, Colorado, Emma grew up spending a great deal of time in the outdoors. During the summer before her senior year of college, she spent five days on the Rogue River with GOALS and it changed her life. Since that time Emma has led both Class I and II GOALS trips through Desolation Canyon on the Green River and Ruby/Horsethief Canyons on the Colorado River. She is currently the Music Teacher at Glenwood Springs Elementary School and has been working over the past few years to establish and grow a GOALS presence in the Roaring Fork Valley. River time is one of Emma’s favorite times of the year. A teacher at heart, she loves taking a group of students who have different levels of comfort and experience on the river and helping them to grow as a group and individually through the challenges that are present on the river. When not on the river Emma loves to backpack, read, and explore new places. David is an Elementary School Music Teacher in Glenwood Springs, Colorado. An avid outdoorsman, he grew up in New Hampshire and spent a great deal of his life hiking, canoeing, and camping in the forests, rivers, and lakes of New England. He also developed a love for whitewater as a rafting guide for a company in Northern Maine. David was introduced to GOALS during his first year teaching in the Roaring Fork Valley in 2015. He was drawn to the program through the opportunity to be a facilitator of learning in the wilderness. He believes in the power of outdoor experience as a tool to help people of all ages gain confidence, self reliance, and critical thinking skills. The GOALS program lends itself directly to this pursuit and David is proud and excited to be able to provide this kind of opportunity to students. Favorite parts of a river trip include: Sunrise coffee, floating and swimming, and scanning for wildlife. Tom is something of a legend within the GOALS family. His presence on the river guarantees a good time. His positive outgoing attitude is contagious. Tom has spent years working with kids, passionately working to ensure kids have a positive future and head out into the world feeling empowered and driven to make their own impact. After seeing the change that occurred within his son after his first expedition is what brought Tom to our doorstep asking how he can join our team. Now Tom has led both his son and daughter on multiple GOALS programs over the years and holds our mission close to heart. Beyond having exceptional skills as a leader, Tom can also paddle a ducky through some pretty big whitewater to top.